Just a quick word about breakfast. We went down to the hotel restaurant where the breakfast buffet was laid out in a room with one glass wall giving a view of the turning millwheel right outside. A table of German tourists were already sitting down and eating. We took a table and started on cereal - bran flakes for M. and muesli with fruit salad and yoghurt for me. While we were eating, a couple of Americans arrived and started their breakfast. M. ordered a fried egg and some toast and tea, while I contented myself with a freshly baked hot croissant, another bowl of muesli, and iced water. The Americans finished their breakfast and left while we were still eating. But when we got up to go, the Germans were still going, eating their breakfasts! Just waiting for our dinner here at a very nice inn we found in a village outside the Cambridge ring road. 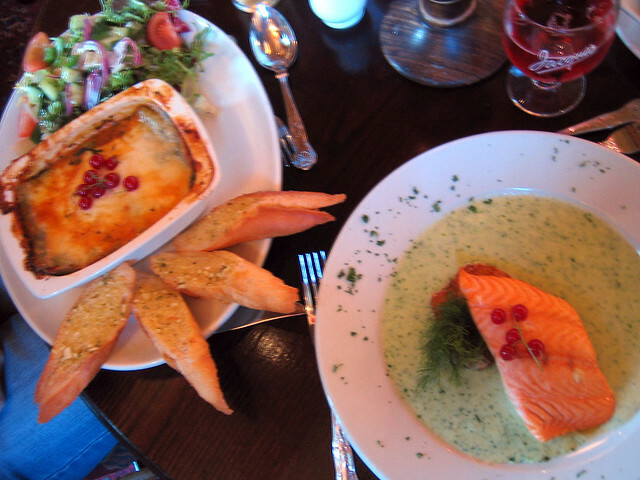 M. has ordered a pepper and spinach lasagne, while I was disappointed they had run out of the duck in black cherry sauce and have gone for char-grilled salmon instead. We arrived here at 19:35 after blasting across the country from Oxford this afternoon. Weird thing about driving in England #3: Half the important road signs (i.e. the ones with directions on them) are hidden by trees growing in front of them. This just adds to everyone getting lost all the time, of course. Despite signs for the park and ride at Oxford being semi-hidden by foliage like 90% of the other road signs, we managed to navigate to the Redbridge Park & Ride successfully and grab ourselves a spot in the large car park amidst hundreds of other cars. The bus was mostly full too. We sat on the top deck at the front as we did in Bath. The bus pulled up in Oxford right outside Christ Church college, our first goal for the day. 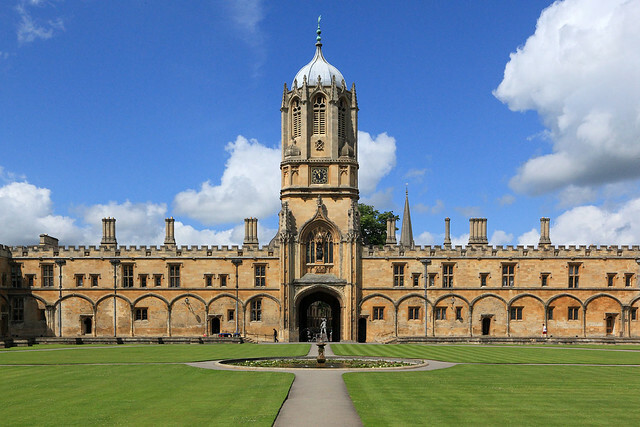 Entering Christ Church via the visitor entrance means walking right past the main quadrangle entrance, which is under the tower housing the famous bell Old Tom. 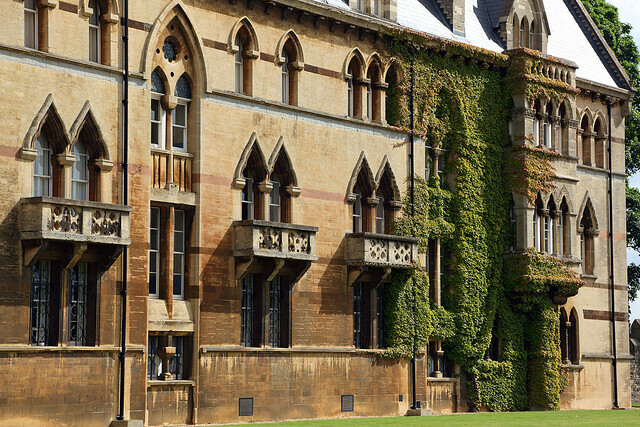 The quad entrance faces a main street and you can look straight in to see students on the lush lawns, but a guard in a black suit and bowler hat keeps the riff-raff out. Instead, visitors must walk a further 100 metres or so to a public gate and enter via the immaculately kept gardens and lawns south of the quad. The southern wall of the college presents a beautiful facade facing the sun, with a single enormous ivy plant growing and spreading up three storeys in one place. The entry fee for the day was £5, reduced from the usual £6 because the Great Hall of the college was closed for the morning. We had to content ourselves with walking the hallowed halls and corridors to visit the cathedral and quad. The cathedral is the smallest one in all England, about the size of an average church, with pillars of stone huddling close all around you as you wander around. 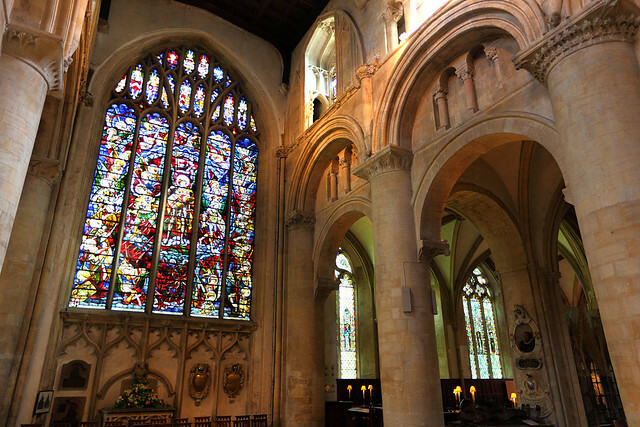 There are several interesting sights, including a gloriously coloured stained glass window depicting the life of Saint Winifred - the patron saint of Oxford. Another window is of medieval origin and depicts the murder of Thomas Becket in 1170. A tour group and several other people were wandering around the college as well, but it wasn't too crowded. 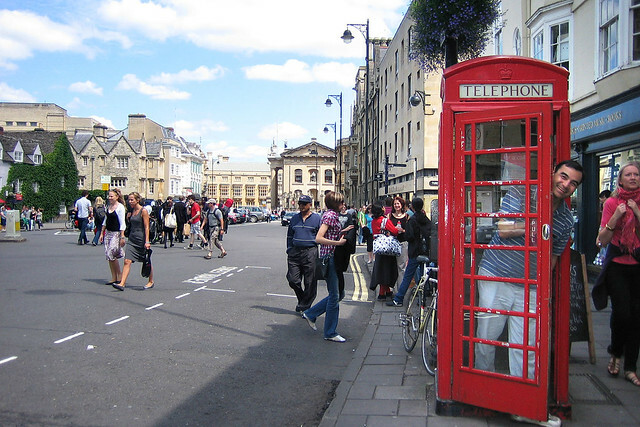 The streets of Oxford, however, were very crowded as we discovered when we exited Christ Church via the visitor exit that led out into a back alley behind the college. Walking up to the High Street deposited us amidst a flurry of pedestrians scurrying to and fro, several in academic gowns. 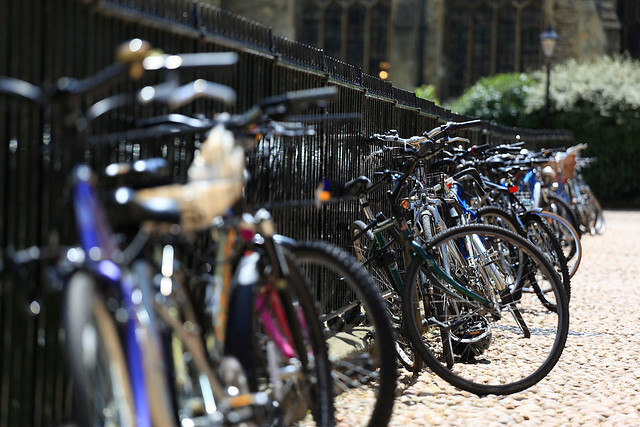 We'd seen some dressed for what appeared to be a graduation in the quadrangle and there were also students' family members and friends around in formalish, attire as well as hordes of other students, shoppers, and tourists, all jostling for space on the street. It was the first time on the trip we were really shoulder to shoulder with crowds of people. M. got a coffee at a handy Caffe Nero and we wandered around in the covered market while she drank it. These covered markets are a cool idea. You are protected from the elements while wandering around a market atmosphere, but many of the stalls are fully fitted out shops selling quality stuff. One in particular here was a large cake shop with windows showing three or four people making decorations for the fancy celebratory cakes. You could sit and watch them at this delicate art and then move on to look at the amazing results displayed in another window. It looked like a very good cake shop. 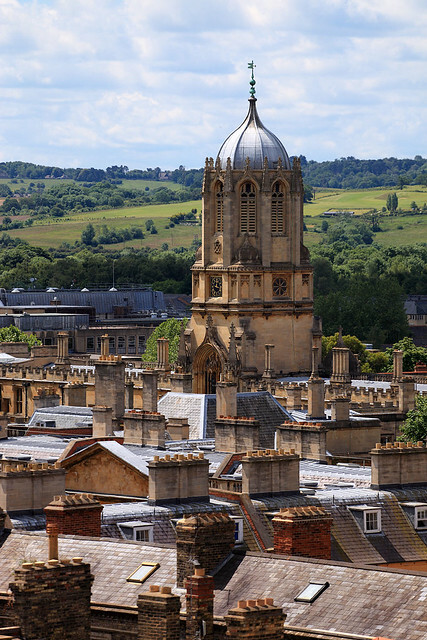 Once the coffee was downed and we'd done a circuit of the markets, we headed over to the University Church of St Mary the Virgin to climb the bell tower and gain panoramic views over Oxford. The church interior itself was not too special and most people - of which there were many - gave it just a quick once over at best before heading straight for the tower. Admission to the tower was supposedly controlled by a harried guy who was trying to deal with shop customers and herd people in multiple languages at once. The door to the tower stood invitingly open and several people made to simply walk in, which prompted the guy to leap out from behind his desk and try futilely to call them back and get them to queue up at a line he began forming when we asked to go up. Some other people dutifully queued behind us, but a group of Germans barged straight past and into the tower entry. The guy managed to pull most of them - but not all of them - back. He was using a closed circuit TV to monitor how many people were up the tower and tried to tell people they had to wait. Eventually he let us (the first people in the queue) go up and we proceeded up a couple of flights of stairs to the ball-ringing chamber, where a woman presided over another queue of people at the back of which were four of the Germans who had escaped the guy downstairs, and were wondering where the rest of their group was (they were well behind us in the queue downstairs). While waiting, we examined the pull-ropes for the bells above. A small sign stated that a full peal of the bells took three and a quarter hours and was performed only once a year, on Boxing Day. After several minutes, a few people came down the stairs from the tower above and exited down the way we had come up. The woman guarding the door let a few of us go up and another woman took £3 from each of us for the privilege. The climb was up a steep and narrow stone spiral staircase, wide enough for just one person, holding on to vertical ropes strung down the core of the spiral. After about three turns of the spiral, we met a group of people coming down. M. stopped in a convenient alcove to let them past, but I simply had to press against the outer wall and let people squeeze past on the inside. The muscles in my stomach started cramping as I held my squished position and the dozen or so people oozed by. Eventually they passed and we continued up another turn of the spiral to the top. 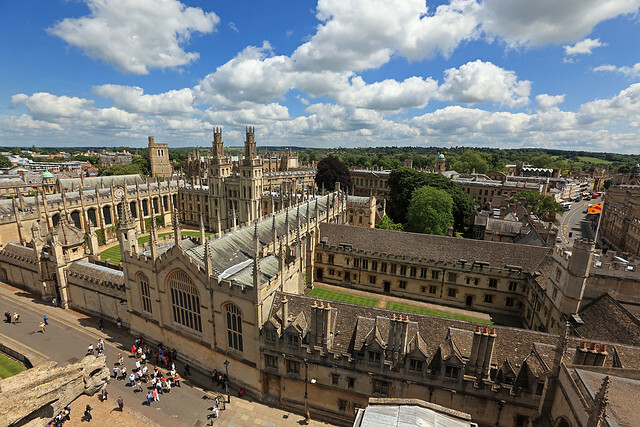 The walkway around the tower was cramped between the stone tower behind and a chest-high stone wall in front of the view all over Oxford. Only at the junctions between the four faces of the square tower and the narrow diagonal tunnels joining them was there an alcove allowing space enough for two people to pass. And the route led once around the tower and to a dead end, so everyone had to go back exactly the way they came. The views were well worth the effort though - spectacular vistas over nearby Gothic spires and gargoyles and rooves belonging to the various colleges and university buildings. 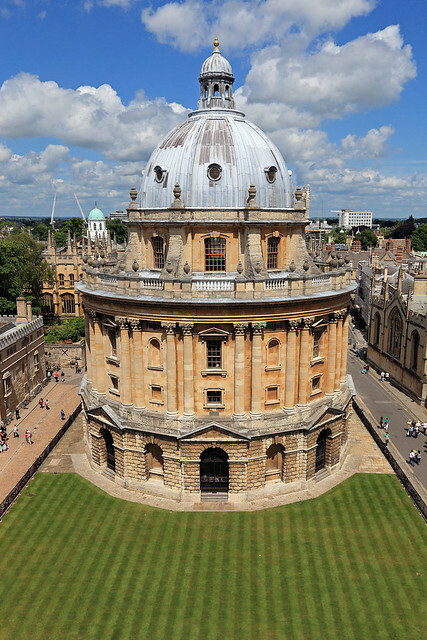 Directly north of the church tower was the vast circular dome of the Radcliffe Camera, set on its grassy yard. At ground level, students and others scurried back and forth, making a teeming mass of ants flowing between the buildings. Just as up a similar tower in Germany, I heard a familiar accent and determined that two of the men up there were from Brisbane with a quick, friendly question. Having done a circuit of the tower, we returned down the Spiral Staircase of Doom. Fortunately we didn't run into anyone coming up and the trip was a lot easier. We exited the church and walked north past the Radcliffe Camera at ground level, noticing that it held a library that was closed to visitors, but with students wandering in and out freely. A turn down Brasenose Street past Brasenose College saw us on to the pedestrian mall of Cornmarket Street. Here we sought lunch, finding a Pret a Manger cafe, where we took a seat upstairs. M. got a hot felafel roll, while I selected a sushi box. The cafe advertised free Wi-Fi access, but every attempt to access it resulted in a wall of login requests and offers to sell us access. Since we needed to check e-mail to get details of tomorrow's meeting with Mike, we put a few pounds on a card to buy some access time. The Wi-Fi kept flaking in and out, but we managed to get the details an also send some e-mails to M. family. After eating, we walked over to the Ashmolean Museum, hoping to browse at least a few of the wondrous exhibits before having to leave. But the museum was closed for refurbishment, so we had to miss out. However, this allowed us to find the Museum of the History of Science when flicking through the Lonely Planet looking for something else to do. This serendipitous find was truly amazing. The museum was small enough to allow us to cover all three of its modest sized floors, but packed to the rafters with unique and historical scientific instruments and apparatus, ranging as far back as ancient Hindu and Roman cosmological devices and sundials. 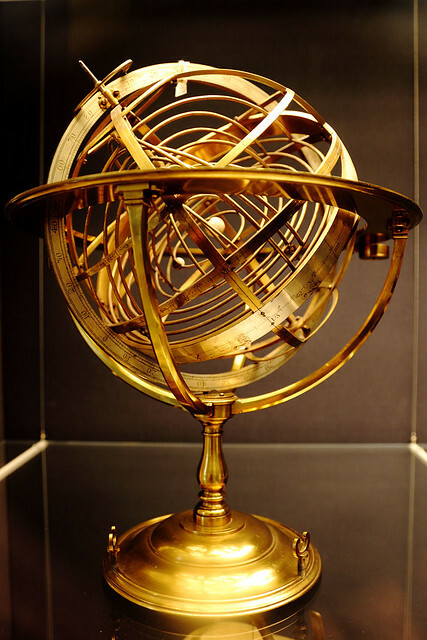 One floor was full of brass sextants, quadrants, astrolabes, orreries, armillery spheres, and so on, plus globes of the Earth, moon, and heavens, ranging from medieval to scientific and industrial revolution times. One brass compass and sundial was inscribed as owned by James Watt. 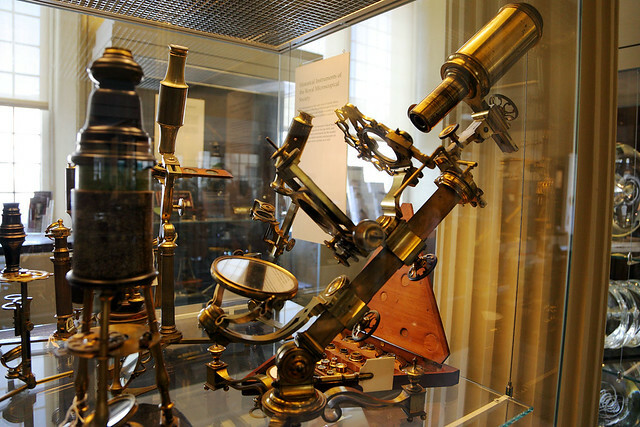 Then there were microscopes galore, telescopes and transit circles, some a couple of metres in length, and one built by William Herschel himself. Glassware filled another couple of cabinets, with flasks and alembics and old vacuum tubes. Some of the bits were ones used by Joseph Priestley. And there were some of the original flasks used by Howard Florey and his team to extract penicillin, including one which still contained some of the actual penicillin mould they grew in their experiments. 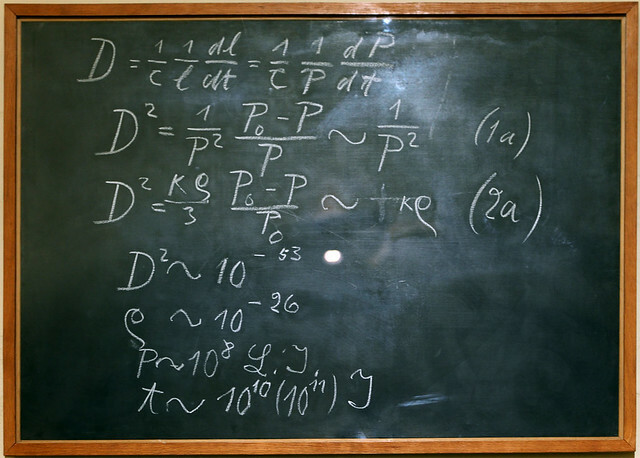 Hung on the wall was a blackboard containing cosmological equations written by Albert Einstein during a guest lecture in 1931. Another display contained calculating rods, Napier's bones, and slide rules of various types - all very old examples. There were brass gadgets inscribed with circular arcs for calculating sines and cosines, wooden solids in polyhedral shapes, old medical kits, sets of calipers and drawing instruments, optical instruments, lenses and mirrors, dried fish, skulls, teeth, and bones of various animals, carved skulls of various materials, illuminated manuscripts of early works of astronomy, detailed anatomical drawings, an enormous pastel drawing of the moon about 15 metres square done entirely by reference through an early telescope in the 18th century, and many more things that I can't remember. Done with the science museum, we exited. The building next door was being used for some sort of formal university ceremony - possibly a graduation. Students in academic dress were lined up with parents in suits and dresses (and some in kilts) to enter the building, but there were also police and a group of protesters there holding banners and chanting slogans quite loudly. We didn't find out what it was about, but took off in the other direction back to Christ Church college. There we tried to gain entry again to the college to see the Great Hall, which should now have been opened to the public. We figured that our discounted £5 ticket might need to be upgraded to the full £6 ticket to cover all the attractions, but the man at the ticket counter simply waved us through. 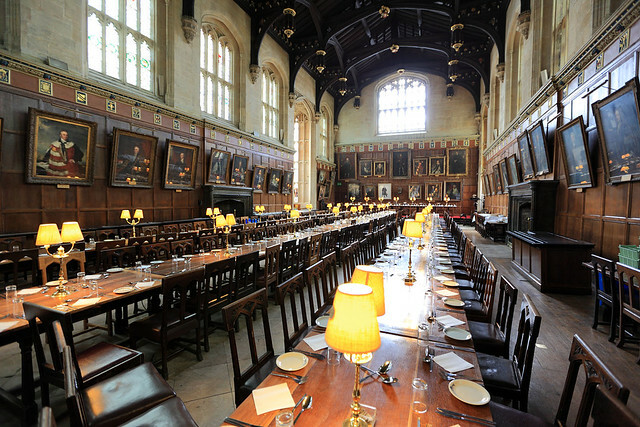 The hall at Christ Church was the inspiration for the Hogwarts dining room scenes in the Harry Potter movies, and it was easy to see the resemblance, with three long rows of tables down the hall, which ended with a perpendicular table on a raise dais for the professors. There was however also a row of cafeteria style serving tables down one side and a side door leading to kitchens - not necessary at Hogwarts of course. Large portraits of former masters of the college lined the walls, including one of John Locke and one of Charles Lutwidge Dodgson (a.k.a. Lewis Carroll) which could be discerned from our limited viewing area near the back of the hall. 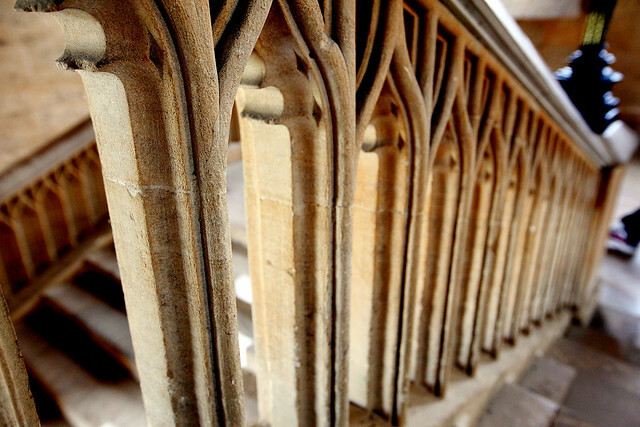 The stairs outside the hall have been used directly in Harry Potter movies, as have other areas of Christ Church, and they made a popular spot for other tourists to take photos. We also spent some time there taking snaps. From here, we exited the college again and got our Park & Ride bus back to the car. We ploughed headlong across country to get to the outskirts of Cambridge. We tried a promising looking town on the map outside the Park & Ride ring around the city, called Cambourne. Unfortunately, this turned out to be a brand new housing estate, not a medieval village, and the only accommodation we saw was a fancy looking hotel-motel thing which looked very expensive. We found a new pub and asked if they had accommodation, but they didn't. The helpful young lady and man behind the bar did however give us directions to the Golden Ball Inn here in Boxworth, which is how we ended up here for the night, paying £89.50 a night. 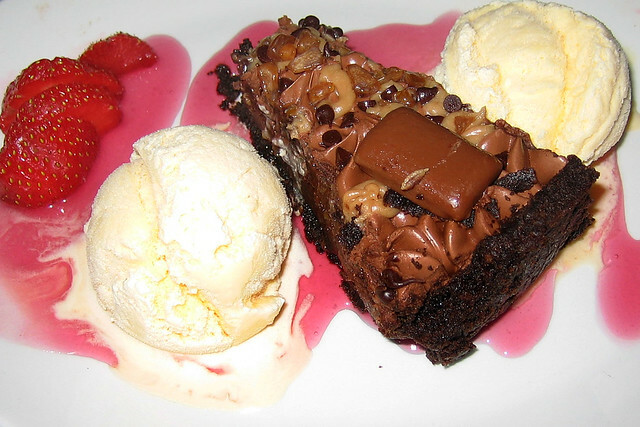 Our dinners were good, and I had a "gold digger's choc crunch" for dessert, which was a rich chocolate mousse cake with lots of nuts and crunchy biscuit pieces in it, while M. had a hot chocolate. Following that, it was bed time. Last updated: Friday, 18 January, 2019; 15:56:15 PST.